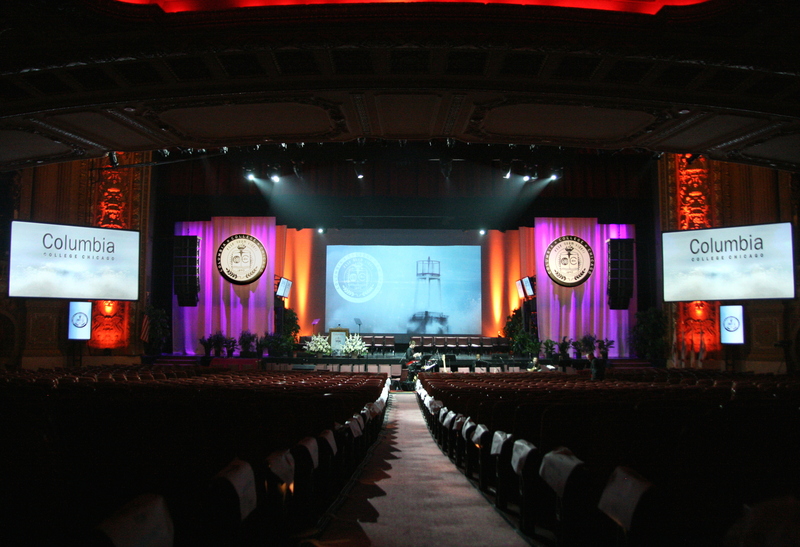 Located at the Chicago Theatre or the Auditorium Theatre, Columbia College Chicago’s annual Commencement is a truly unique ceremony. 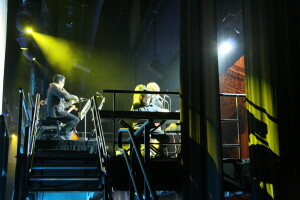 The event begins with an hour-long musical pre-show. The college jazz band and choir perform, along with a variety of small ensembles. 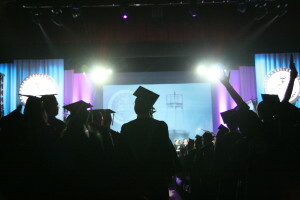 At the conclusion of the pre-show, the stage quickly transforms from a concert into a full-blown graduation ceremony. The most challenging aspect of this production is designing a show that can seamlessly transition from a musical event incorporating 50+ musicians in 6 different onstage areas into a graduation ceremony. The versatility of our Wenger Vision staging systems allows us have the quick changes the production requires. 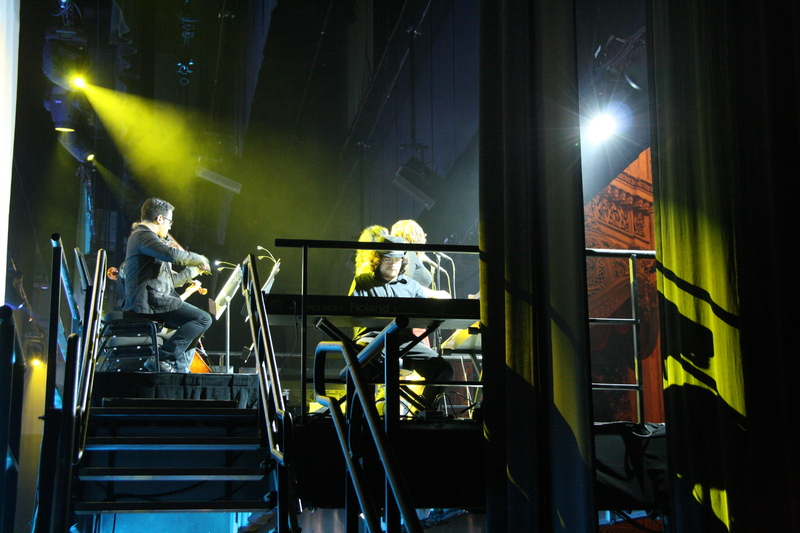 We use the system to build 9′ tall stage platforms that are in use as two-tier performer stages during the pre-show. 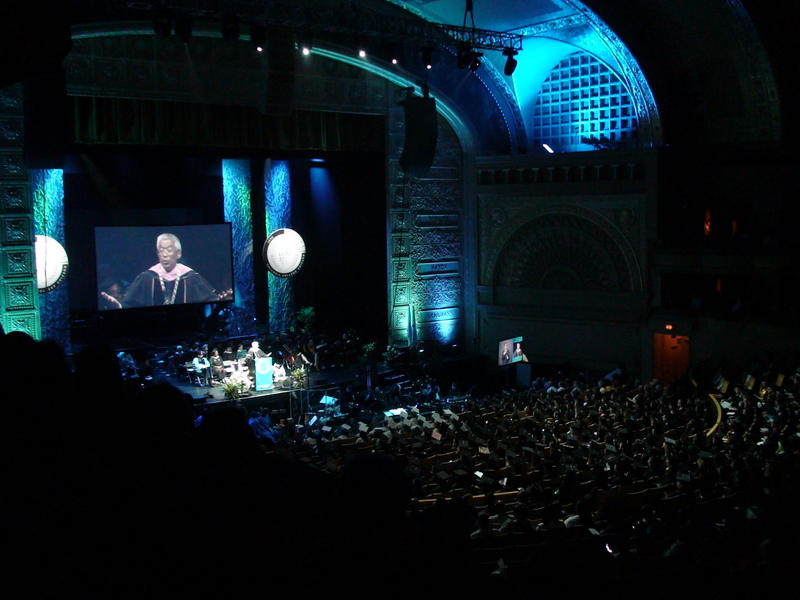 Columbia’s graduation ceremony has a very unique set of challenges for the Technotrix audio engineers involved. Sound reinforcement must be provided for two distinctly different parts of the program and transition seamlessly. Due to the large amount of performers involved in the show, we use our Avid Profile systems to their maximum 96 channel capability. The Front of House position is responsible for both the house and broadcast mix while the Monitor position is responsible for 24 discrete monitor mixes across the stage. With the flexibility offered by today’s moving lights and top-tier lighting desks, our lighting designers are able to program a very dynamic show. For the musical pre-show, the lighting is an all-out rock show. 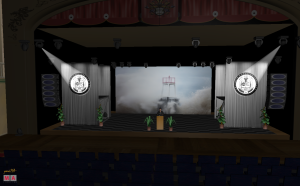 As the program transitions out of the pre-show, the lighting is a highly effective tool to move into a more formal and ceremonial atmosphere, accenting the the venue and enhancing the mood. 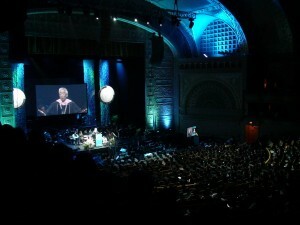 Perhaps the biggest challenge on the lighting side is the lack of programming time. In 2013, there were only 2 or 3 hours total of on-site programming time, which is a fraction of what is needed for an intense fully cued show. 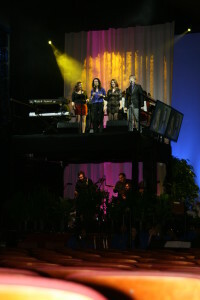 Our lighting team spent days in pre-production rendering the stage setup and pre-programming lighting cues, so that the few hours spent on-site with the rig were sufficient to get the show ready.